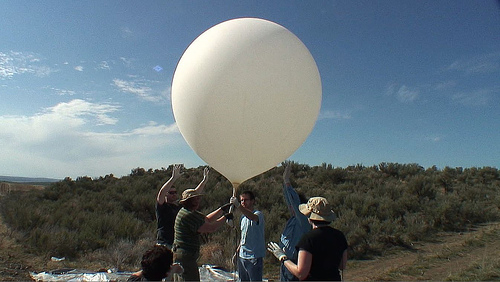 AHAB was “A High Altitude Balloon” project posted on Make Magazine plus original PDF posting. Some novice balloonists with tons of electronic skill devised a payload including cameras, cell phones and GPS equipment to take photos from near space. The GPS data transmitted back indicated they achieved 109,000ft which is just amazing. Photos from near space would have been spectacular. Unfortunately they never found the payload. There GPS transmitter gave out during the descent around 60,000ft. They searched but with no luck. The call went out for others to help in the search. I was going to be in the area on a vacation to the Pacific Coast a few months later so I got the new projected targets, my GPS and a team to help search. (See our results posted at Make Magazine). The following larger photos are boring snapshots of us at the target areas. Sorry to say we too did not find the payload. You are currently browsing the ToddFun.com blog archives for June, 2007.